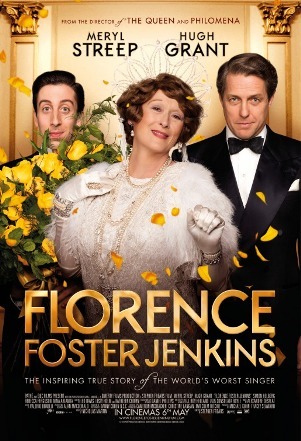 Paramount Pictures releases Florence Foster Jenkins nationwide on August 12th, 2016. NYC MOVIE GURU: Meryl, what was your introduction to the music of Florence Foster Jenkins like? Meryl Streep: I was in a play at drama school, and the orchestra, in the pit was the students at the Yale School of Music and one lunch break they were all screaming and laughing over, a little gaggle in the corner—they were usually so dour that we were alarmed. The actors went over and said, “What are you listening to?” And it was Florence--a cassette. Yeah. That’s when I first heard of her. NYC MOVIE GURU: Hugh, did you like your character of St.Clair? Hugh Grant: No, no, I liked him, enormously actually. First from the script and then when I dived deeper into the archives here at Lincoln Center. He charmed me, he properly loved her and she loved him and it was a very moving 35-year romance. Was there any element of self-interest in it for him? Probably, yes, but I’m not even sure it was conscious, it may have been subconscious. In fact he isn’t anything without her. It was definitely real love, and I think that’s probably why he protected her from the truth. NYC MOVIE GURU: Simon, what was it like to convey emotions through your face? Simon Helberg: Well, I was born with a hilarious face. That’s why I was cast. No, it was not but thank God we do all this press stuff afterwards because I would have been so self-conscious because everyone keeps talking about my face. Everything was so new, and I think Meryl and I were so locked in and surrendered to never knowing what was going to happen next, and that creates some funny expressions. MS: Originally we were told that we would be pre-recording and, as in most musicals, they play it on the set, but the consistency of the recording helps them cut. They can’t really cut things that cut a completely different time signature from take to take. We did the record whole, but we did it all live, and that helped us be very alive because it changed each time. Stephen Frears: The performances seemed so central to it all. Meryl doing it, Florence doing it---that was what really mattered at that moment, so that’s what you really wanted to capture not something sort of mechanical. NYC MOVIE GURU: Meryl, was it hard for you to sing live? MS: It was way way more fun, it was more terrifying, especially the Carnegie Hall sequence where we shot the audience first---just so that we could get an honest surprise, but we set ourselves up to fail big time. The audience reaction is really their reaction. NYC MOVIE GURU: Meryl, was it difficult for you to sing badly? MS: I have a very clear understanding of what my voice is--it hovers around B-, B+. And I have great friends who are wonderful singers and I know I’ll never be able to do that, but singing through a character is something I can do and I liked finding what it was in Florence’s recordings because there are recordings of hers that remain very popular—--she’s there for all to hear. It’s not just bad it is, it’s how aspirant it is and how hopeful it is. You hear her breathing in the wrong places. It led me to understand her, her exuberance, and her will to make it right. NYC MOVIE GURU: How would you brand the kind of love that Florence and St. Clair have? MS: I haven’t really been successful branding love--especially peering into other people’s relationships. It’s almost always not what you think it is from the outside. I think that it’s an accurate portrayal of realistic delusional love. It’s realistic because it is what it is, and there is illusion in it that they keep aloft. It’s a bubble of happiness. One of the genius things that Stephen [Frears] did with this is that in the film, in the margins, you feel the war. It just comes in every once in a while with some blaring headline of something horrible happening---there are so many analogies to now. It's about figuring out what makes life worth living. It's love and art as far as I’m concerned which is right smack in the middle. So the compromises people make to keep their happiness intact, I think that is all in the service of good. NYC MOVIE GURU: Did they really believe that they were in love with one another? HG: I think that they convinced themselves that they did have an understanding that things were fine, but clearly they're not really fine. Somewhere deep down inside, they're troubled, but you have to cut St. Clair a little slack because poor ol' Florence did have syphilis, and that's tricky. NYC MOVIE GURU: Do you think that Florence had all of those opportunities to sing because she was in the upper class of society? MS: I think that that kind of spirit can live in anybody. You can't buy out Carnegie Hall, but you can certainly sing in your kitchen and not give a damn about anybody. But, specifically speaking to that time, women of privilege and education didn't have many opportunities of many places to put that spirit. So, they found their ranking and importance in these clubs. Florence was a member of 60 clubs, and gave huge amounts of money away. Women didn't matter. They didn't do anything in law, politics, business---except for a few outliers. This was where women would shine. She had a big dream and wore ridiculous clothes, but she was happy. NYC MOVIE GURU: Was there anything that you were passionate about in your childhood that just didn't work out? MS: I can’t do a lot of things. I don’t like golf. I mean, I really don’t. I tend to like things I can do right away, and if I can’t do it right away, I don’t like it. So, skiing I really like because you can sort of get up on skis, and if you’re coordinated and if you’re reckless, you can lean forward and go. But, golf, no? Nobody can do that. I never hit the ball ever, and my husband kept saying “You’re coming up on the ball!” and I’m like “I’m not coming up. I’m not going anywhere!” And I’d swing right above it and it was always sitting there.